Our home should be our personal wellness oasis – where children can have pillow fights and mess around with the dog, where babies can play on the floor and parents can relax after work. Hytect tiles make it possible to design an individual favourite place while creating a healthy and comfortable living space at the same time. Relax, enjoy, switch off. Living and dining rooms are the focal point of a home: guests are entertained, children play there, the odd glass is knocked over in the hustle and bustle ... no problem! After all, the hydrophilic surface displayed by Hytect tiles means that dirt and spills which are hard to remove on other floors can be easily wiped away. And the living area always looks respectable. At night, we come to rest and regenerate after our stressful everyday lives – if the room climate is right. With Hytect, even allergy sufferers can enjoy a relaxing sleep. These tiles are easy to keep free of dust and they filter unpleasant odours and pollutants out of the air. Enabling us to kick off the day fresh! Although so much water and shampoo flows in the shower or bath, our bathrooms are not intended to be sterile wet rooms. 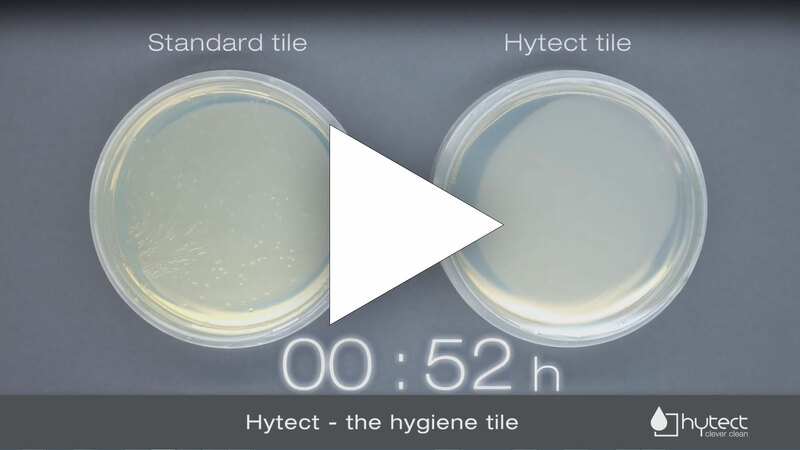 Hytect tiles withstand water as a wet element, are easy to clean as well as being effective against bacteria, mould and fungi. Thanks to their attractive and contemporary design, there is nothing “wet” about them at all! Wellness comparable to a private spa! Come on in! The hall area needs to cope with dirty street shoes, wellies and paw prints while still looking inviting. The easy-clean, antibacterial surface displayed by Hytect tiles and combined with the very best in designer quality makes this possible. For an entrance which always look stylish! The warm months encourage us to spend more time outdoors, transforming the patio into a cosy open-air room. This requires a floor covering which is perfectly matched to the conditions outdoors. Hytect patio tiles are weatherproof, non-slip, easy to clean, and even break down moss and algae. For a summer full of highlights! When work and everyday tasks are complete, it's time for some pampering. Time for a sauna, followed by a cold shower and another sweat ... stress is alleviated and new strength gathered. And to ensure that deep relaxation is maintained after such time-outs, antibacterial, easy-clean Hytect tiles guarantee hygienic cleanliness. Simply switch off and relax – that’s what wellness feels like! Dive in, splash about, swim lengths – a swimming pool is the crowning glory in any home, leaving nothing else to be desired. The perfect look and optimum safety in and around the pool is provided by pool tiles featuring Hytect technology. They are resistant to constant contact with water, easy to clean and non-slip. And they stave off algae, fungi and germs. For carefree swimming pleasure! Usually guest WCs are accommodated in only a few square metres. But it goes without saying that we still want to offer our visitors a stylish and presentable room. Thanks to the large selection of Hytect tiles, a wellness atmosphere is easily created – and not just visually. After all, Hytect also filters unpleasant odours out of the air. For a toilet with a freshness boost! If you can’t stand the heat ... Family and friends get together to cook and bake, grease splatters against the wall, crumbs of dough fall on the floor. This calls for wall and floor tiles which can be cleaned again in no time: with Hytect. Always ready for the next kitchen battle! The ideal Hytect tile for any living style: from mosaics to XXL formats, from purist designs to expressive motifs or ornamental patterns, from wall tiles to non-slip floor and patio tiles. Enabling you to create a unique living space entirely in line with your personal tastes. are non-slip, durable and easy to clean. Their natural wood and stone looks offer the perfect backdrop for interiors to find complete expression. in formats of up to 35 x 100 cm give rise to a luxurious ambience in the bathroom. XXL tiles are also the perfect choice for shower areas thanks to their low joint ratio. combine the durable effect of Hytect with effective design. Using graphic motifs, geometric patterns, relief or glossy looks to create stylish highlights. achieve a stylish city flair. These slim, faceted tiles are never dominant but their brick-like arrangement also prevents them from being monotonous. exude the cosy warmth of wood while offering the advantages of ceramic tiles. They are resistant to moisture which also makes them eminently suitable for bathrooms. achieve a visual connection when laid uniformly in various rooms, creating a feeling of expanse. Combined on walls and floors, the result is pure elegance as an integrated whole. can be real eye-catchers. Whether as color combinations, clean plain shades or a modern country house style, these small tiles always make a huge impact. combine the comfort of Hytect with the authentic look, characteristic texture and pleasant feel of natural stone such as slate, basalt or marble. pay tribute to popular ancient terrazzo floors featuring rock splinters. These tiles impress with a unique and lively play on colors and shapes. conjure up a breath of nostalgia in our modern world. They pick up on elements of Art Deco and Art Nouveau, building a bridge to the here and now using a wide variety of interpretations. add momentum to your home – and not only on the wall or floor. These circular ceramic tiles are also an attractive highlight on shelves, benches or in niches. make your outdoor area homely and Hytect ensures that it stays that way. They remain impervious to wind and weather, and moss or algae are simply broken down. 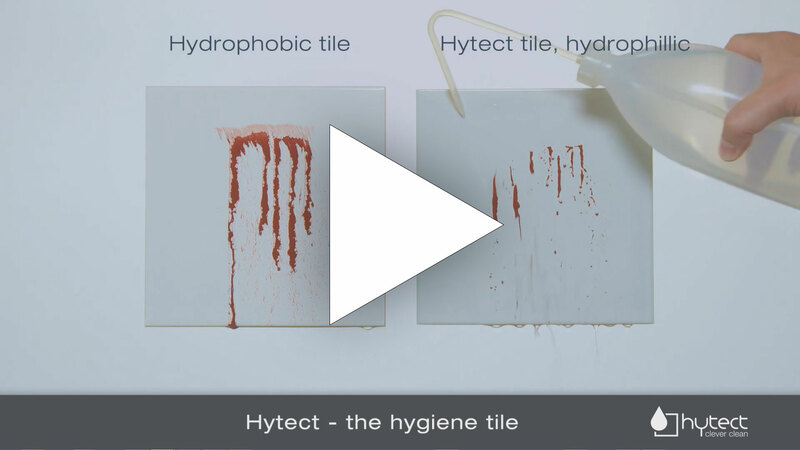 A Hytect tile is easier to clean thanks to its hydrophilic surface. Dirt and limescale find it difficult to gain a foothold. Instead of drops which pearl off ineffectively, water forms a fine film on the tile. Dirt particles are rinsed off and can be easily removed. This reduces both the effort involved in cleaning and the use of cleaning agents. The antibacterial effect displayed by the surface kills bacteria, mould and germs. When Hytect interacts with light, oxygen is activated which breaks down the microorganisms. This not only happens with bacteria, mould and algae indoors but also with algae and moss outside. Hytect activates an air-purification process during which pollutants such as nitrogen oxides are neutralised. Tiles already represent a pleasant floor and wall covering as they do not emit any vapours. To top this, Hytect filters out pollutants and unpleasant odours from the air. The result: a permanently fresh indoor climate. More and more people suffer from allergies caused by the increase in environmental pollution. It is hugely important, therefore, to create a healthy home. The choice of wall and floor coverings plays a decisive role in this process. 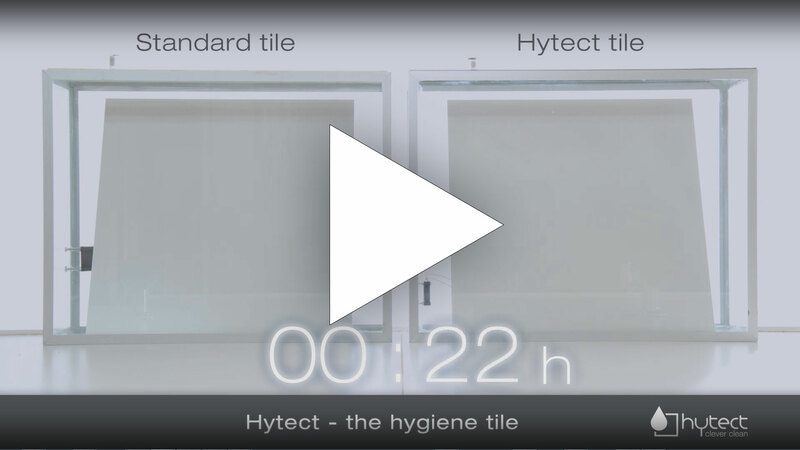 The perfect solution: Hytect tiles! After all, allergens such as pollen or house dust are unable to gain a foothold and bacteria, germs and mould are simply killed. What's more, the tiles are free of vapours and also filter pollutants out of the air. Enabling allergy sufferers to breathe easily! Thanks to innovative production processes and unique technologies, tiles offered by AGROB BUCHTAL and Jasba are distinguished by first-class quality, creative design and healthy comfort. The extensive range of mosaics, wall, floor and patio tiles made in Germany reveals an enormous scope for designing exclusive living areas. The perfect tile for any requirement and any taste.